Honestly, I wish I considered putting down books more often. It’s rare for me to DNF a book. Sometimes this works in my favor, like in the cases of the books I’m about to share with y’all, and sometimes it doesn’t and I just wasted precious hours of my life. Today we’re talking about the times when I’ve stuck it out and it’s paid off… So let’s get started! 1. Outlander – I know, right?! I almost put down book one of my favorite series ever. Crazyness… But those first 100 pages or so were not the most grabbing. It’s after she crosses those stones that things get super interesting fast! 2. 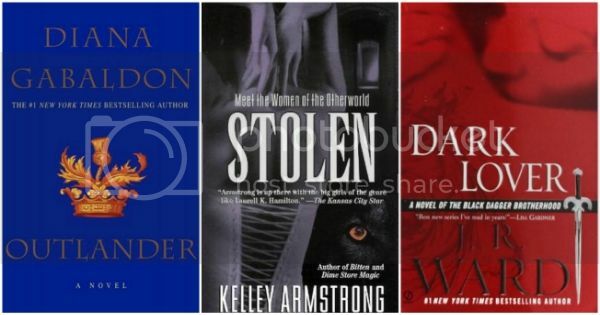 Stolen – This is the second book in the Women of the Otherworld series. When I first read the first, Bitten, I was hooked. I wanted to read more about these characters! Realizing that Kelley Armstrong was expanding on that world with Stolen, and wouldn’t just focus on the characters in Bitten, kind of let me down at first… But I kept on with the story and by the end I wanted to know about ALLLL the characters, this world, and MORE! 3. Dark Lover – I must admit that Wrath isn’t what made me devour this series. At first, he irritated me so much I wanted to put it down…but then Brother after Brother, I fell for them. It’s the cast of Brothers that really made me continue this series. 5. 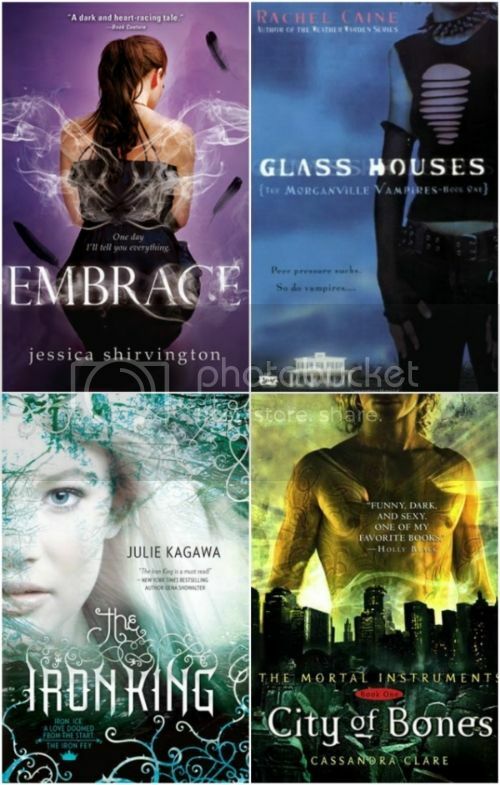 Glass Houses – The main reason I almost put this book down were the female characters. I found them sort of annoying at first. Had this and the next book not been so short, I probably would’ve stopped at this one, but I’m so glad I didn’t because, not only do I end up loving the main character Claire, it’s turned into one of my favorite vampires series. 7. City of Bones – I picked this book up after binge reading the Twilight series and seeing Meyer’s blurb on the cover. But I could not get into it at first! Coming off the Twilight high (yeah, it gave me a high because it was the first series I’d read in full since I was 12!) I wanted that same Bella and Edward kind of love right off the bat. But as we know Clary and Jace’s romance takes a little longer to build up. So I wanted to put it down because it wasn’t like Twilight. There, sue me. I didn’t know better!! 10. 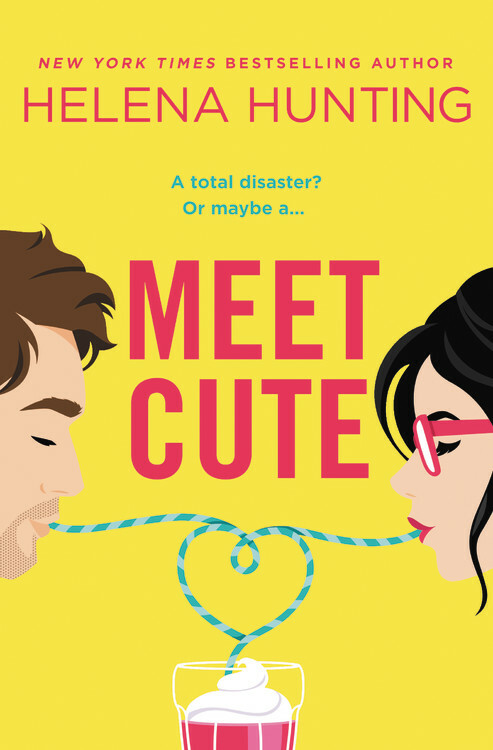 Forget You – If you’ve read this book, you probably get why this might be on this list. Yup, it’s because of Zoey. I wanted to give up on this book because she frustrated the crap out of me. Check out my review for more ranty details! I’ve had a number of people recommend Outlander to me, since I adore superlong books and historicals, though I’m a bit off-put by all the hype and popularity. Usually it goes badly when I try to read a really hyped book, though once in awhile I do agree with the crowd. Oh, Outlander… that book was a monster. Truth be told, I never considered not finishing it, I am however, a little nervous about going into the rest of the series. I also almost didn’t finish Obsidian- I hated everything about the book. Daemon, the girl (whose name I cannot remember), all of it *angry sigh*. Haha. 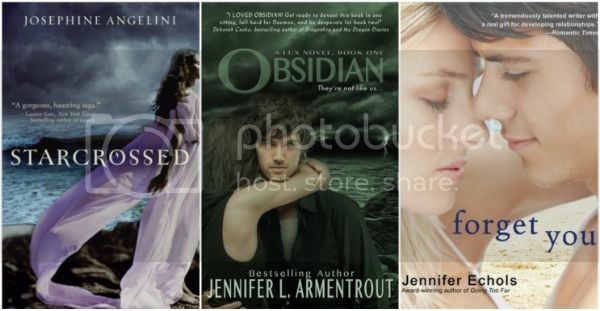 I have Obsidian on my TBR pile, but I haven’t managed to get around to it yet. I wonder if I will feel the same way as you and many others. I agree with you about Outlander, it took me a while to get into, but I’m glad I read it! I read Outlander but (as is usual with me and series) had no desire to move on to the next book! Can I just say that everytime I visit your blog I involuntarily gasp??? Obsedian & Forget You are sitting on my shelf to read. My 1st experience with Armentrout wasn’t WINNING for me, but I finally picked up the book all the raves are about. But that bad taste is still in my mouth. I’ll get to it soonish. In that list I’ve only read TMI (City of bones), outlander, obsidian. I honestly liked City of bones to twilight (I didn’t like twi and that was my DNF *ducks flying objects* and wasn’t a fan). Initially my issue with it came with the extension. Outlander yeah tough cookie (I thought GoT was hard). Obsidian was ok just cause I laughed a lot and its JLA. I’m an Echols fan Forget you was a TBR but every time I open it it just deflates. Oh yes, Embrace & The Iron King are PERFECT picks. I felt exactly the same way about them. I like both series, but the first books (especially Iron King) didn’t sell me 100% on the stories. I tend to get annoyed with female characters pretty regularly as well. They act like children so often! I’ve been trying to read Outlander for years but have yet to get past thinking about it. It’s rare for me to DNF as well but I’m trying to get better at it. There’s just too many good books out there to waste time with the bad ones! It’s actually really easy for be to DNF a book, so I really struggled with this list. I know what you mean about Daemon – he is such a jerk in Obsidian, but he got so much better and now I totally love him!!! Great list! I love BDB and I really want to read Glass Houses. I feel like there are some that start out slow but once you reach a certain point, it’s like – I CAN”T BELIEVE THIS IS SO AWESOME!!! I have Outlander on my TBR list so I will keep that in mind that it starts off slow. Here’s mine.